After assembling this house, I did not like the flimsy roof. Dollhouse enthusiasts KNOW that you do not carry a dollhouse by the roof, but if you need someone to help you move it they ALWAYS go for the roof. So I decided to strengthen it. I also wanted more access to the tower room, so I began to make it bigger. I did this by bumping out the roof. I added some small octagonal windows to the attic areas, and a dormer on the right hand side. Here is a side view of the newly bumped out tower-room roof. You'd think I would be happy with the house now, but alas, I wanted to make it a little bigger. Sooooo, I bumped out the lower left room. I also changed the big windows in the middle rooms to single windows. So far, I think I like the changes I have made to this house. Some projects just take on a life of their own, don't they? Yes, they sure do! 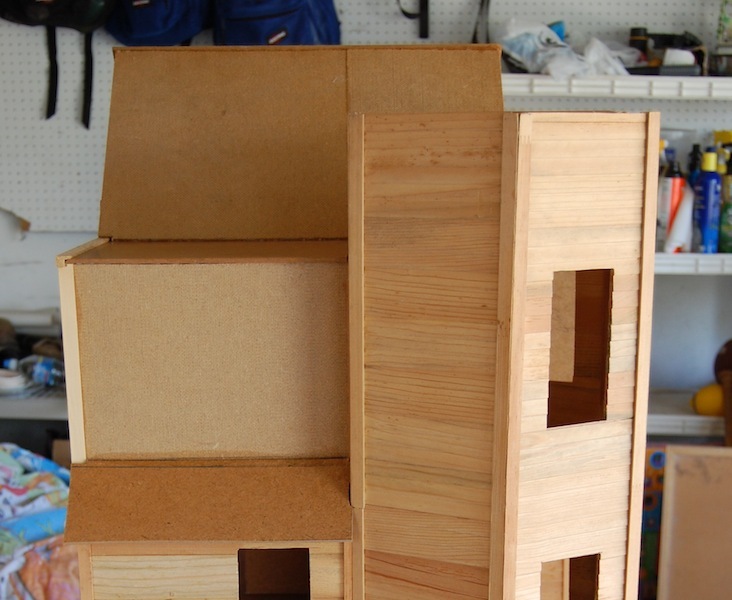 I sometimes wonder what it would be like to just build a dollhouse the way the manufacturer intended. Somehow I always have to change them! It's so exciting to customize them, and I like where you are going with this! Thanks Jodi. I don't really know if it is "exciting" to customize them, but every dollhouse I build wants to be something very different from the original. In any case it keeps me busy! Wow, Sam! It looks amazing! I can't wait to see it it turns out in the end! Nice work! Thanks Wendy. I can't wait either! I am longing to see some of my houses finished. I am beginning to doubt that it will ever happen. You have certainly made this house kit more than the sum of its parts Sam, and I am very excited to see what you will do with in next. Thanks Elizabeth! Hopefully my roof is secure! There is a ton of wood and glue holding it together. Whenever I get someone to help me move a big house they always (logically) go for the roof. It makes me cringe. I love it. Your bump outs and expansion of the house look lovely and make perfect sense. I especially like the extra space on the attic level. Changing the large windows for smaller ones actually adds realism and makes it look less like a dollhouse. Great work! Thanks Giac! I love extra space, and it seems that all my dollhouses are always asking for it. After assembling all the windows for this house I decided that I did not like them (too flimsy) and I will be purchasing new ones. I like the smaller window openings now as well. I see you're thinking of everything... even future transport issues... ;O) It's great to see how your arranging this kit to your likes and needs. Thanks Birgit. I think it is in my blood to change every dollhouse I own! I cannot help it, but I am making them my very own for sure! Thanks Caroline. I think the little windows are necessary otherwise the attic would be too dark! Oh wow Sam! This house is going to be absolutely awesome when it's all completed. I love all the little adjustments you have made, it really gives it character. Thanks Xanadu. I am actually hoping to finish a dollhouse sometime within my lifetime. I am always changing and rearranging them!